Is Your SMB SAN for VMware Small Enough? It is generally accepted in the marketplace that businesses of all sizes receive great benefits from virtualising their servers. The clear cost savings from reducing the number of physical servers is huge for business managers. Saving money is an easy decision, which has made deploying VMware the top project in companies who have 10 to 10 thousand users. Virtualisation also offers significant flexibility and availability benefits that help IT managers. Having the right infrastructure to support server virtualisation helps save time and effort. Expertise not withstanding, every IT manager at a small company can benefit from these time and effort savings! As a bonus, IT and business managers experience improved service levels and greater availability of applications for everyone. Historically only larger enterprises could afford SAN storage and the VMware licensing to fully utilise mobility and high availability (HA) features built into VMware software. For millions of smaller organisations, cost has been a limiting factor. Shared SAN enables all vSphere servers to see the same storage, enabling movement of VMs and applications across redundant infrastructure. This architecture opens up tremendous flexibility and IT managers can move applications without impacting user access or uptime. This is a life saver when it comes to maintenance; move a VM and application, perform maintenance, migrate back--without users even noticing. Without SAN, VMs are limited to one physical server and directattached storage and are subject to downtime for maintenance or extended downtime in the event of a failure. VMware vSphere Essentials Kits are all-in-one solutions that combine virtualisation for up to three physical servers (up to two processors each) with centralised management capabilities. The Essentials Plus Kit provides the same enterprise fault tolerance usually affordable only for larger organisations, just for smaller organisations. You can upgrade from the Essentials Kit to Essentials Plus to get vMotion, High Availability, and Data Recovery capabilities. The Essentials Plus Kit and an iSCSI SAN make easy and affordable HA possible for SMBs and departments. Deploy iSCSI SAN storage, easy one-click setup with Drobo, configure Smart Volumes. Rescan to recognise storage, finish storage configuration with VMs. Configure network to enable communication between servers (can be done in advance). For the additional capability of Storage vMotion, vSphere Enterprise edition is required. Click in vCenter to test and trigger vMotion, you have mobility and HA! 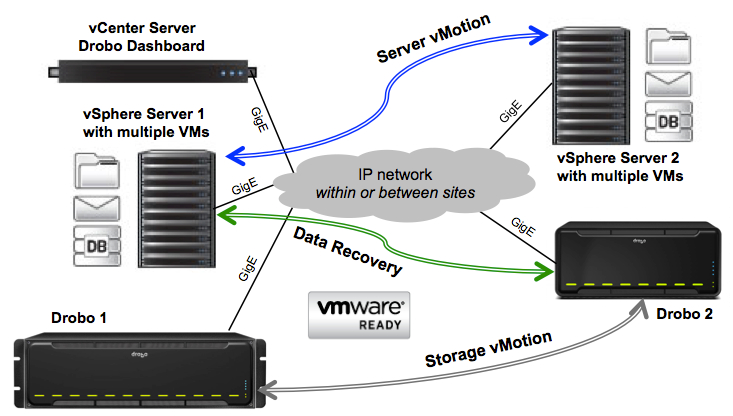 SAN storage is a must if you want to maximise mobility and availability for VMware. Fibre Channel SANs have a high entry cost preventing companies with smaller configurations and budgets from participating. iSCSI can be lower in price, but many iSCSI arrays are still several tens of thousands of dollars for each system and considered high cost by most measures. Vendors claim that iSCSI arrays are easy to use and deploy, but most are built with large enterprises in mind. Drobo provides superior data protection with BeyondRAID™ technology, in easy-to-use and affordable packages that are designed especially for SMBs. Without the cost burden of features that are already built into vSphere and the Essentials Plus Kit, customers can buy the two iSCSI SAN arrays needed for DR and fund the Essentials Plus Kit for less cost than other entry solutions—or less than half the cost of most enterprise iSCSI arrays. With Drobo, there is no reason you cannot reap the benefits of a highly available virtualised environment.